Erin Hart's crime novels feature American pathologist Nora Gavin and Irish archaeologist Cormac Maguire, who are engaged in the recovery of artefacts and human remains from boglands. This "Gavin and Maguire" series is set in Ireland and revolves around the themes of archaeology, forensics, history, traditional music and folklore. 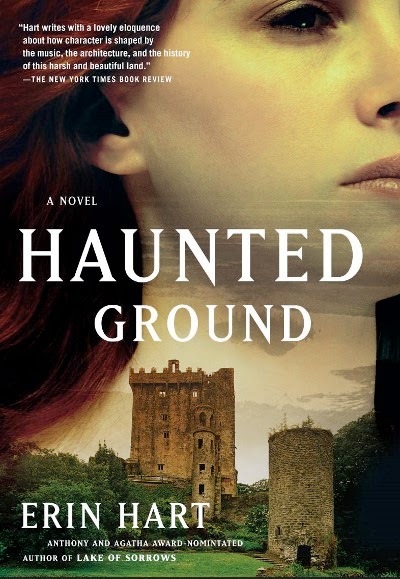 It begins with Haunted Ground (2003), which has been translated into at least 10 languages. When a red-haired girl's severed head is found in an ancient bog in southeast Galway, it may be an historical relic or the answer to a local mystery. As Maguire and Gavin investigate, they reawaken an interest in the missing Mina Osborne, who vanished with her young son two years ago. The sequel Lake Of Sorrows (2004) was copy-edited by today's bestselling author Tana French - still a freelancer in the publishing world at the time. The other two books in the series so far are False Mermaid (2010) and The Book Of Killowen (2013). Hart also wrote an essay on A.S. Byatt's Possession in the 2012 anthology Books to Die For, edited by John Connolly and Declan Burke. Born in Crawfordsville, Indiana in the US, Hart was raised in Rochester, Minnesota. Her early career was in arts admin and freelance journalism, contributing theatre reviews and arts features. She later studied for an MA in English and Creative Writing at the University of Minnesota. She is a founder of the Twin Cities Irish Music & Dance Association, and lives in Saint Paul with her husband, Irish accordion player Paddy O'Brien. His memoir The Road From Castlebarnagh (2012) recounts growing up in County Offaly. Also check out: A podcast (MP3) in which Hart describes her work.